I have many July 4th memories growing up. One in particular was repeated for 13 years straight. Yes, 13 YEARS! My parents were not travelers. We never went on big vacations when I was young, so 4 hours was the farthest I’ve ever been away from home. Staycation? In this case, yes, I consider it that. A trip to my grandfather’s cabin in the woods for 1-2 weeks was always my summer vacation. To be honest, I was jealous of my elementary school friends when they gushed about their trips to Disney, or to the beach. Our 4th of Julys were celebrated at a state park with a cookout and swimming, then a parade at the nearby town, which was always much anticipated. I’ll always remember the large crowd lining up along the main street, the beautiful Victorian homes, the balloons my parents would buy me, the rifles going off which scared the poop out of me, and the cotton candy. Then there was the really big park that was like the size of Central Park. Well, maybe not that big, but it was big to a child’s eyes. That was where we watched the town’s fireworks, and I remember how close and impressive they were. Then we drove back to the cabin and lit sparklers and threw snappers on the rocks. Staying in a cabin in the woods was not really my thing, especially when I got older, but the July 4th celebration in small town, USA was awesome! Another thing my brothers, cousins and I would do is roast marshmallows. We did this at every cookout we had, but I don’t recall ever making s’mores. The gooey chocolate melted on a hot marshmallow sandwiched between 2 graham crackers was probably something my mother didn’t want to mess with. 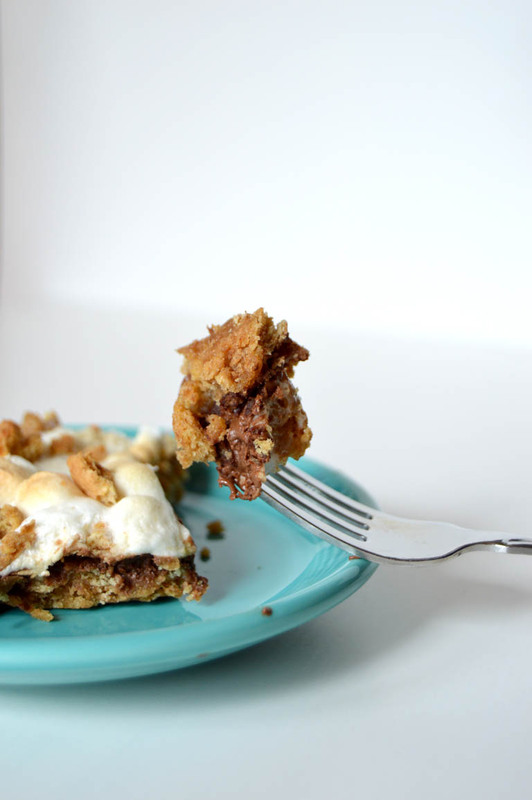 It makes me think this is why she always made these s’mores bars because the mess is confined in a baking dish. As for myself, I don’t mind the mess. Eventually I’ll introduce Alex to the real campfire method, but she does love this version. 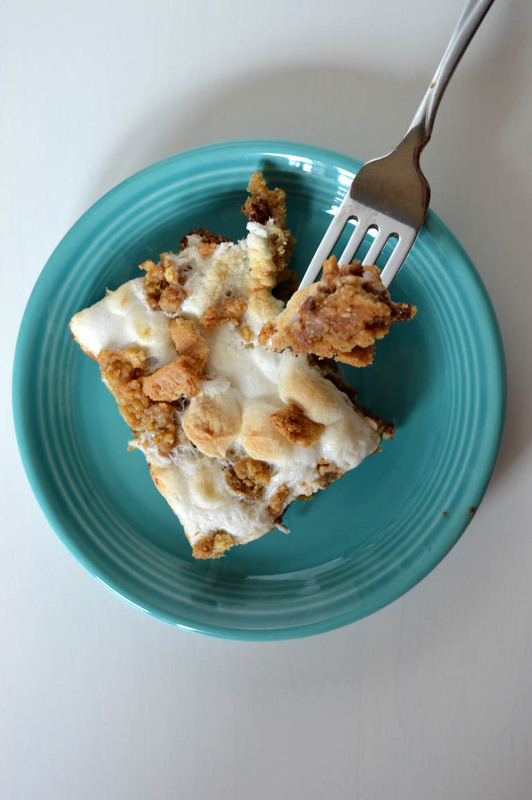 This alternative to a cookout staple is real easy to make, and it still provides you with the ooey-gooey when you pick up a slice out of the pan. 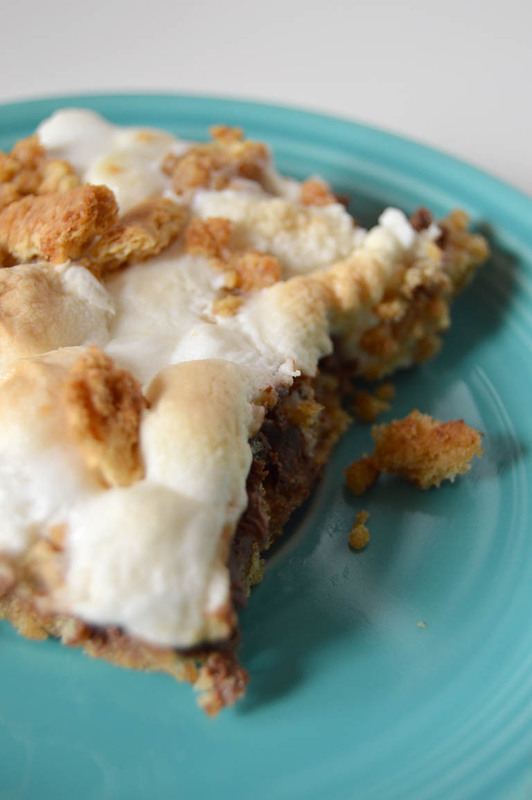 So raise up your s’mores, messy or not so messy, and here’s to a great-American treat on a great-American holiday. Enjoy the parades, the fireworks, the food! Hope everyone has a very happy and safe Independence Day! – Preheat oven to 350-degrees. Spray a 13×9-inch baking dish with non-stick cooking spray. – In a mixing bowl with paddle attachment, beat margarine and sugar on medium speed until light and fluffy. Blend in egg and vanilla extract. Fold in crushed graham crackers, flour and salt. 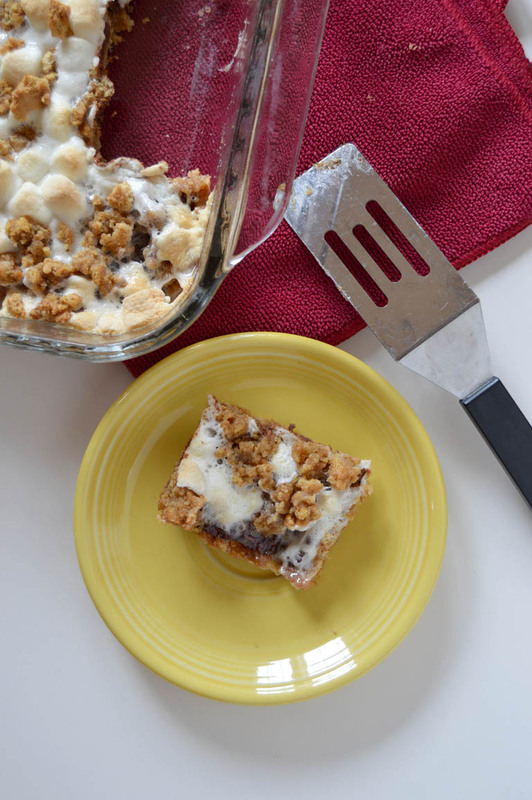 – Take 2 or 3 cups of graham cracker mixture and press down into baking dish, covering the entire bottom of dish. 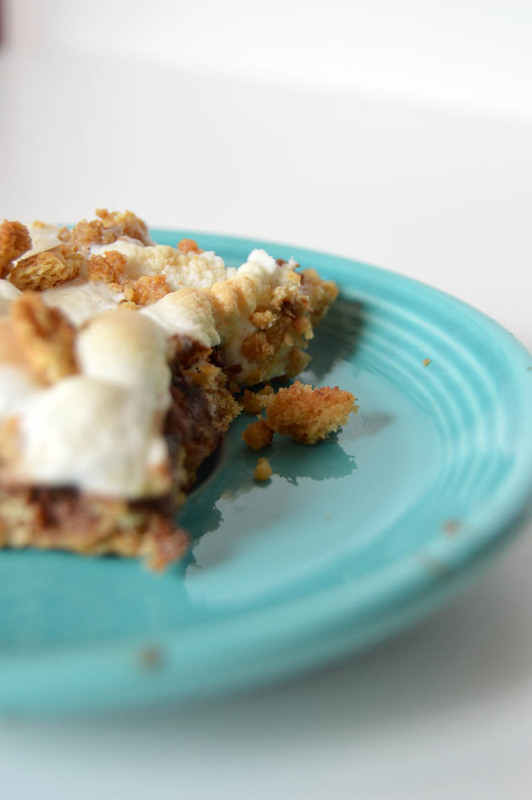 – Place the chocolate bars side-by-side, over the graham cracker mixture. Sprinkle the mini-marshmallows on top of the chocolate bars. 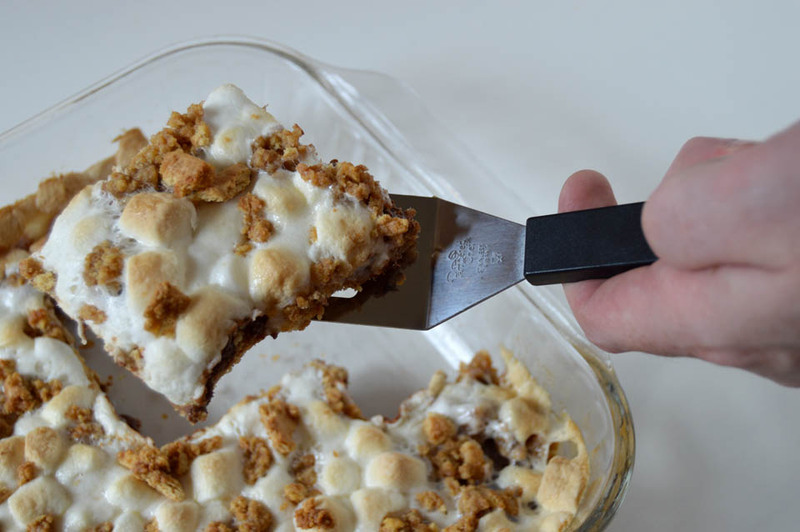 Crumble the remaining graham cracker mixture over top of the marshmallows. 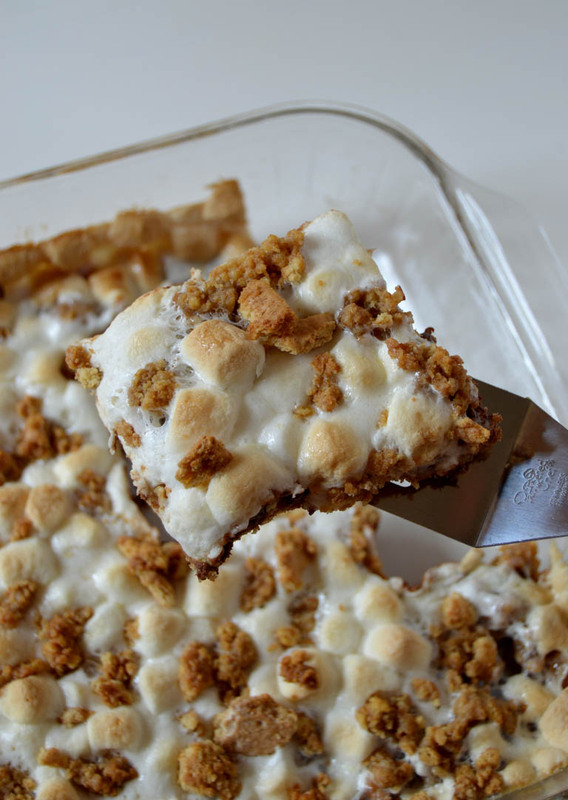 – Bake 20-25 minutes or until the marshmallows are a little golden brown. Cool completely before slicing into bars.